A post-stroke diary recommended for anyone interested in aphasia. Sudden and unexpected loss of communication is a terrifying, dehumanizing experience that tears away at the essence of life itself. For decades, speech and language pathologists have sought to better understand it. The term aphasia is used to generally describe a condition whereby speech and language skills are partially or totally lost. Aphasia is the result of damage to or disturbance of those areas in the brain responsible for speech and language functions. World Alone has been written to help open this often closed door. . .
her aphasia that the reader is actually drawn up into the agony and frustration that is the daily burden of the aphasic individual. Speech pathologists who actively work with aphasic patients will immediately recognize the value of Helen Wulf's analysis of her aphasia. Her reactions to various forms of treatment will also be beneficial, especially to those who are allowing certain aphasics to determine which speech and language deficits are most debilitating and, consequently, which area should be emphasized in the initial stages of treatment. Family and friends of the aphasic will be warmly introduced to those inner thoughts so long hidden from their ears. . . This book. . . should be extremely useful in family counseling. . . As many speech pathologists have indicated, the need for "family treatment" is immediate, real, and often of critical importance. . .
As the field of aphasia rehabilitation continues its growth ... our ability to help the aphasic and his family will expand. It is felt that in its small way, this book will help make aphasia less of a world alone. A new chapter has been added to this revised edition in which Helen Wulf assesses her feelings and the progress she has made six to eight years post-stroke. Helen Harlan Wulf was born in Chicago, and attended Northwestern University, where she was elected to Phi Beta Kappa and received a B.A. dgree in 1935. She holds the M.A. degree in Sociology (1958) from Southern Methodist University. Mrs. Wulf now lives in Dallas, Texas, where she has for more than twenty years been associated with her husband in his business as a manufacturer’s sales representative in children’s apparel. 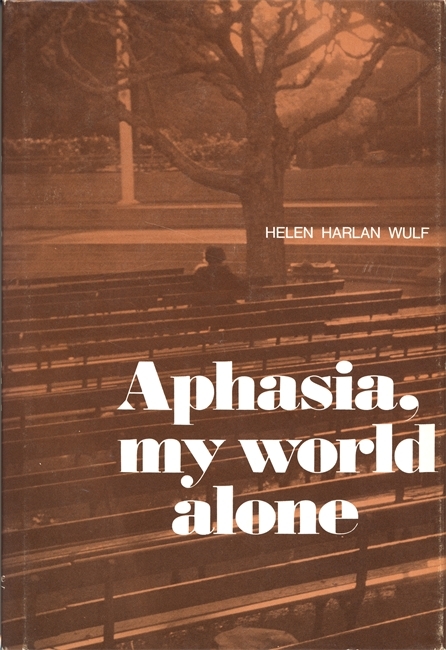 Mrs. Wulf's book contributes many insights and deepens our understanding of the devastating effects of aphasia.